Coco's Loft: Kwik Sew 3914 Pleated Skirt - CurlyPops Skirt Sew-Along! 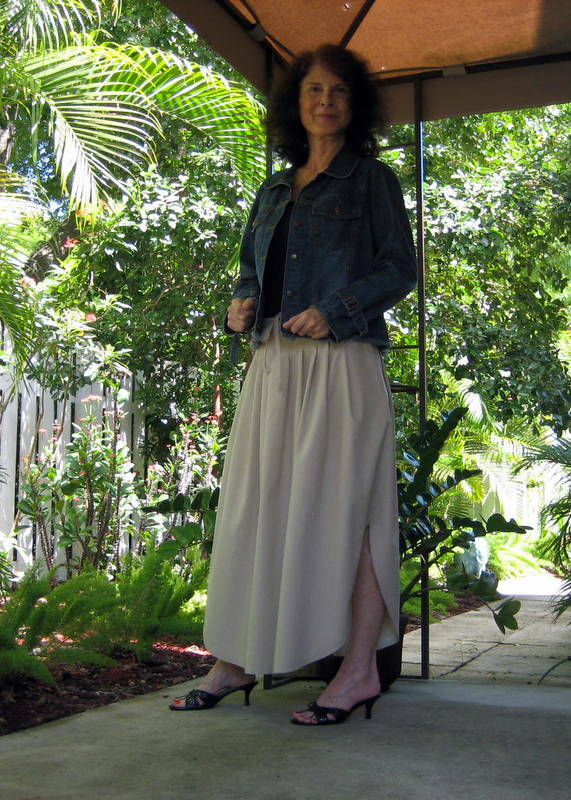 Kwik Sew 3914 Pleated Skirt - CurlyPops Skirt Sew-Along! 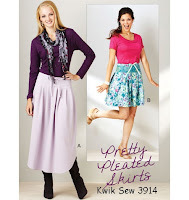 I first saw this pattern in March, when BMV Club started announcing their plans for offering Kwik Sew - it was showcased on several of their email newsletters. Something about it just said Coco! 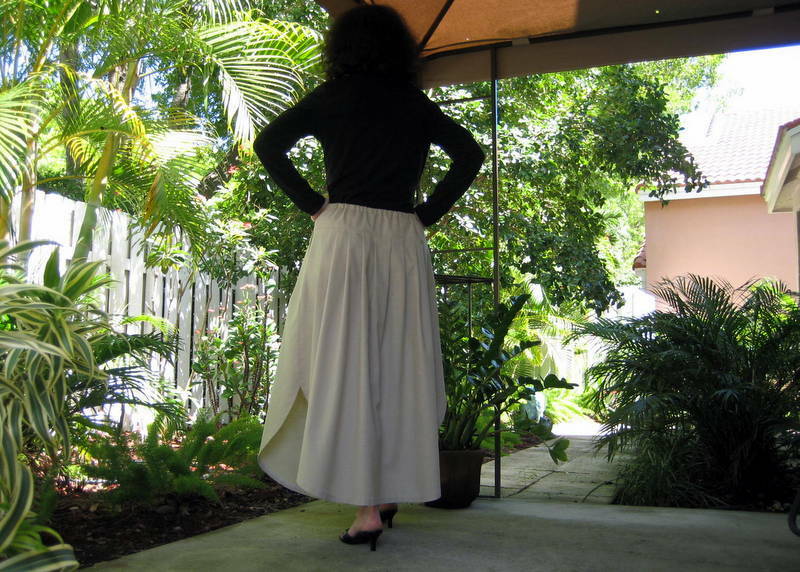 When CurlyPops hosted her 'Make it in May' Skirt Sew-Along, this pattern was my absolute first choice, and the sew-along got me going. I really enjoy a sew-along. Before I started my blog, I had no idea how much fun I was missing. I love the pics and camaraderie, enjoy reading the blog posts, and find so many fellow bloggers this way. Back to the skirt! I think all the fun and style are in the long version (natch...). 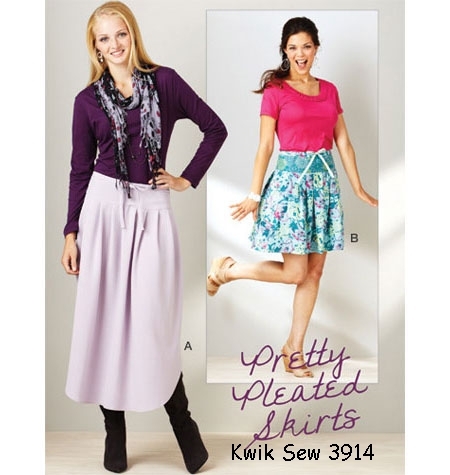 The pleats (ten on the front, ten on the back) and curved side seams are beautifully balanced by the yoke. While the skirt has a drawstring, the gathers and ease are conservative - just enough for comfortable entrance and exit. This leaves a nice waist finish for tucked-in tops. The drawstring casing is a bit different - it is finished on top of the yoke, rather than on the inside. A small change but it adds a bit of detail interest to the skirt top edge. Does the pattern run large? Have been thinking about this. I have a 30" waist, 38 1/2" hips (low end of the Medium scale), sewed a Medium, and have a slightly large fit. I will probably sew a Small next time, being careful with the yoke measurements. I enjoyed sewing the skirt! It was not difficult, but it had interesting elements that kept me involved. The pattern provided good instructions, particularly in managing the very long curves in the hem. The curves are prepped with both staystitching and ease stitching - with these and lots of pins, I did not have any fabric drag problems when I turned and topstitched the hem. Often when I'm sewing, I think about what attractions a pattern might have for sewists at different skill levels. 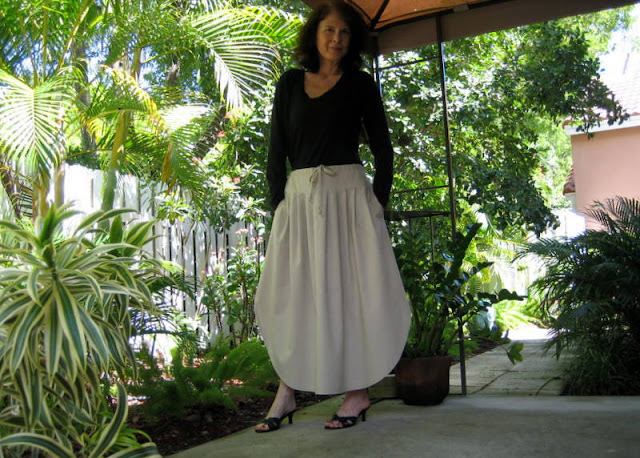 This pattern is a good opportunity to learn/practice a number of basic skills: drawstring and casing, curved hems, slit side seams, attached yoke, and flat pleats. And I think the short version with the straight hem would be really cute and fresh to make and wear! (1) Added 2" to the length, to make it a true ankle length for me. (2) Added pockets in the side seams - of course! 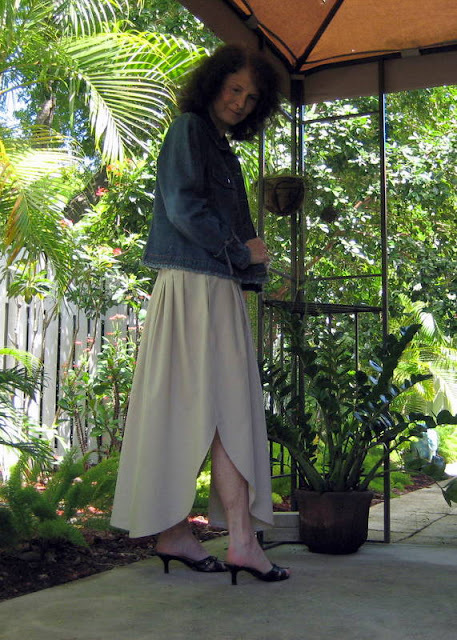 I put the pockets right up at the top of the skirt side seam, since the yoke provided drop from the waist. Also, I left the seam allowance on the pocket at 5/8" on purpose, to weight it a bit. For these last two you have to imagine that I have on my brown suede boots! I took them out but honestly...it was soooo hot by the end of this photo session that I just couldn't do it :-) But boots would look great! Thankyou so much for joining in with the sew-along. It's such great motivation to finish a project. Your skirt is beautiful. 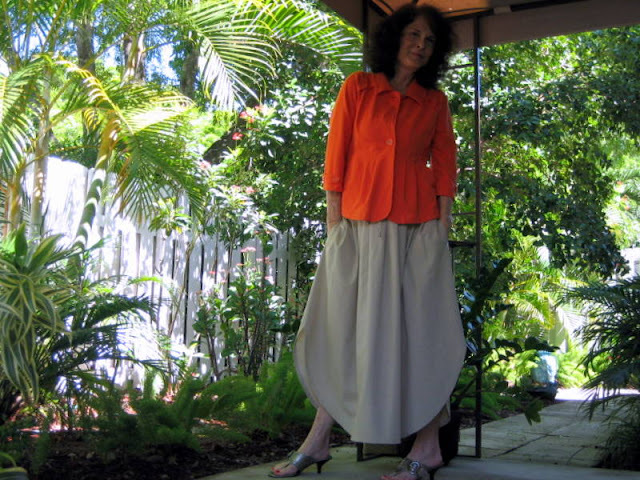 I especially like it with the orange blouse. Thanks for a great review. Thank you, Carolyn! If you are a QVC watcher, Motto is one of their lines - cute clothes, good price. Some things are meant to be purchased! Found your blog...surprise, your lovely granddaughter and I have the same name :-)I will enjoy keeping up with your stories! My first gold star on Pattern Review! © Coco's Loft. 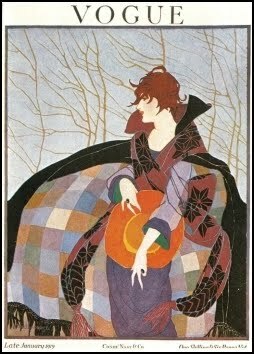 Title art by Alexander Henry, 'Hip Girls'. Ethereal theme. Powered by Blogger.